Received this album from Dave Ray, owner of Beat Pharm, the uber-cool record store, located on Union Avenue, by the library, in Pueblo. Could spend all day in there. Dated 1972, and under the direction of R.L. Bollig, the 32 member Creighton Jr. High Jazz Ensemble of Lakewood (saxophone, flute, trumpet, trombone, piano, bass, and drums) sounds more like a junior high assembly stage band, than an actual jazz group, but I won't judge the kids too harshly. I usually don't go for school band things, but this one intrigued me, if only for the fact that the kiddos do an spirited version of "Black Magic Woman." 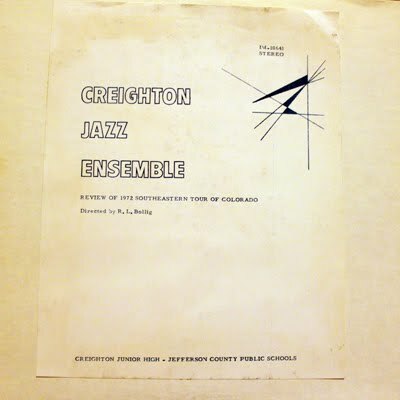 The album appears on the IM record label of Denver (IM-10641-1972). 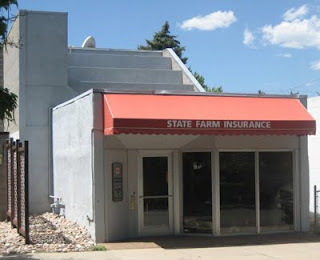 A quick search of the address finds that it's now home to an insurance company. By the way...I grew up attending what was then called junior high school, so I'm not sure when they became "middle schools," or when they decided to go up to ninth grade in some parts of the country. Back in my day, ninth grade was high school, but I digress.